Brochures are one of the most effective ways to explain your business, sell a product or tell your story. They can be included in mailings, used as a tradeshow handout or a pickup display item. Our numerous folding options allow you flexibility in design and presentation. Brochures are printed on heavyweight stock, with gloss, uv-high-gloss or matte finish and take colour exceptionally well. Enviro uses recycled stock with no finish. Specialty options include colour stock, a variety of textures and paper grain. For economy printing we provide, hi-resolution gray-scale printing. 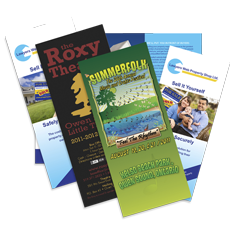 Brochures can be rush printed in 12-24 hours at slightly higher prices. Paper/Finish: 80 or 100lb Gloss or Matte Stock. Also available on 100% Recycle Paper 80lb Text Stock, specialty papers and coloured stock. Finishing: Folding – roll, half, Z-fold, gate, double-gate, accordion, double parallel or 8 page fold.